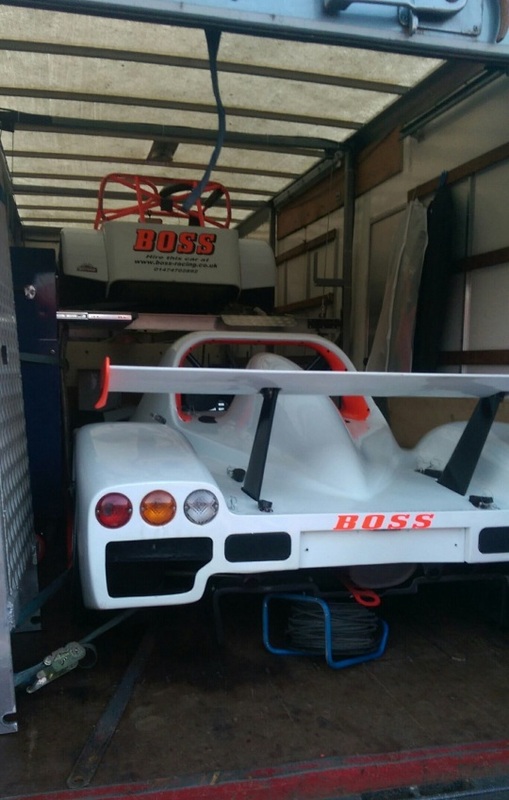 On Wednesday 1st April Boss Racing headed over to Brands Hatch to host our first promotional Track day. Our guest of honour was the editor of the Low Flying magazine from the Lotus 7 Club, Michael Calvert. We had our brand new shirts on, along with a fully stocked refreshments table, and were ready to show Michael what we can do, what we can offer, and a chance to drive our cars. We took along the Racical SR3 and number 93, one of our Caterham C400s. 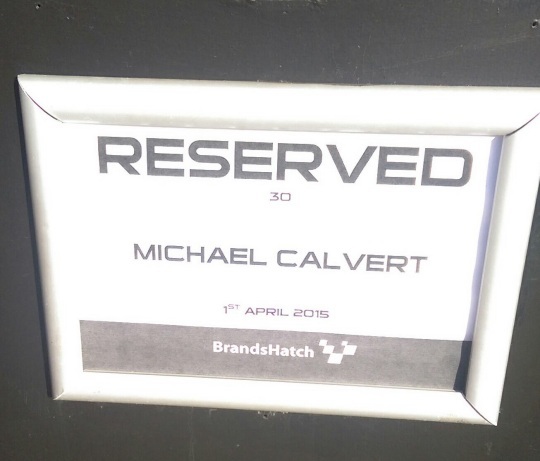 We know Michael is obviously a Caterham man, but we thought we’d bring him something new and different to try. The day started well, with Michael attending the briefing while we sound tested the cars. The Caterham sound tested near to the maximum level so Colin fitted a silencer to the exhaust. When Michael returned to the garage, tea, coffee and bacon baps were consumed, and after a brief chat about the cars Michael was out on track in one of our race winning race cars. Michael returned to the garage after having some trouble with the Caterhams noise level, but that was soon fixed and he was back out on track. The sun was shining, the car was perfectly set up, and when he did finally come back to the pits he had a huge smile on his face. Ben explained our upcoming marketing plans, and Michelle explained about our social media set up, both of which which he seemed impressed with, and then it was back to all car talk with Rob and Colin. 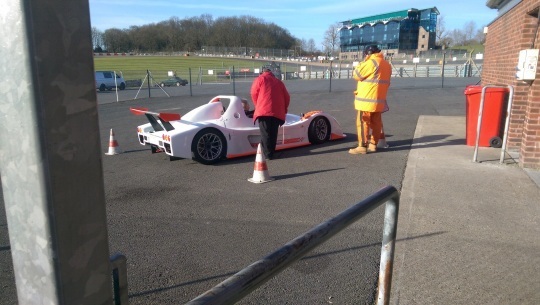 Before lunch we sent him out in the Radical, after talking him through the car and it’s handling Michael took it out for a spin. I must admit, that car does look epic in the sunshine! 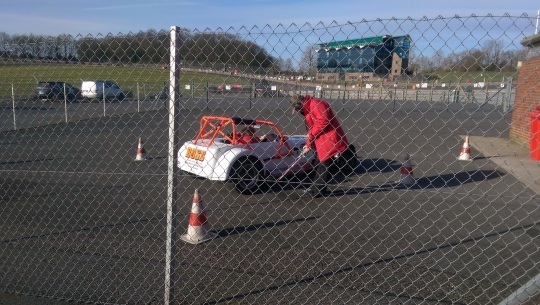 Twenty minutes later he had noticed how much lighter the steering in the Radical is compared to the Caterham, but he was still intrigued and wanted to try it again. Lunch took place in the infamous Kentagon, and after healthy portions of sausage and chips for Michelle, cottage pie for Michael, and a leek and cheese pasty for Colin, it was time to talk business. This was our chance to really tell Michael what we are all about, where and how Boss Racing started, and how we have grown from a lone man building engines to where we are today. He heard all about our racing history and how well our ever expanding race team is doing today, and we had a great discussion about our favourite tracks. Michael was also very interested to hear about the garage side of the business, and intrigued by Rob’s Caterham background. He seemed surprised to hear that we can build not only a Cateram but also a race winning engine for it all in house, as well as being able to deal with everyday servicing for basic road Caterhams. After lunch Michael couldn’t help himself but take the Radical out for one last spin. It is different to drive to the Caterham but once he was used to it he thoroughly enjoyed it. 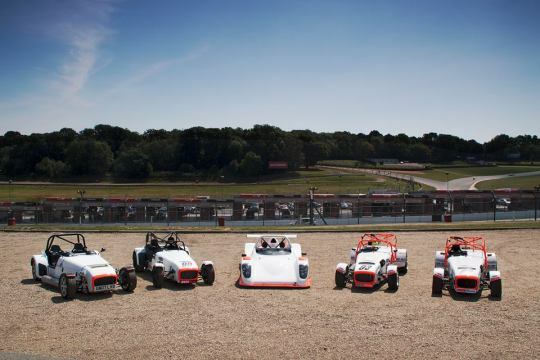 He even said how much he liked that we had a range of cars available for hire, not just Caterhams. But Michael is a Caterham man, so he took the C400 out twice more, and each time he appeared to grow more and more impressed with the car. In between drives he had many questions for Colin and Rob, and it became clear he appreciated how much work goes in to each of our vehicles. 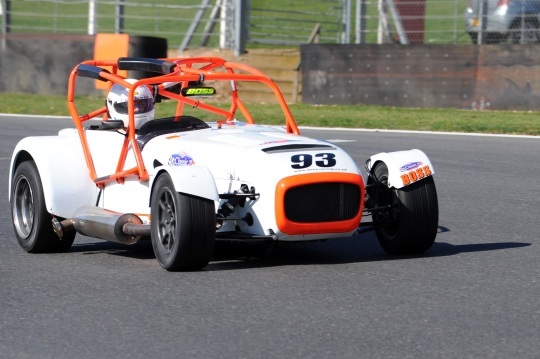 To combat the previous high noise level in the Caterham, Rob had popped back to the workshop and built a new exhaust pipe which came out under the back wheel of the car, reducing noise levels. The speed it was built and attached impressed Michael, which as we said, is a benefit to being so close to the track. All in all it was a great day. 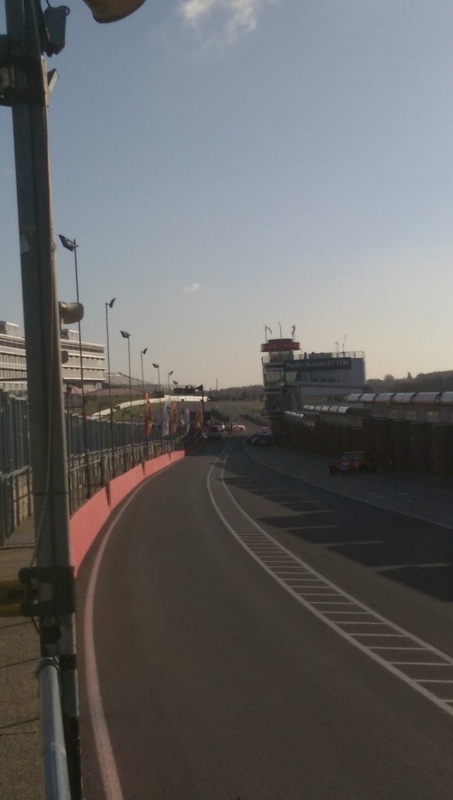 The sun was shining, the cars performed better than we could have imagined, and the day went smoothly. Michael thinks we have a great concept, and the cars are brilliant, it is now just a matter of getting us out there and getting the bookings. Our adverts are already in the Low Flying magazine, and you can find Michael’s article in the 2015 May edition. At the end of July we had a great day at Brands Hatch doing a photo shoot with the full Boss Racing fleet. I must admit, I do think it looks impressive. We had such a good day for it, the sun really brings out the signature Boss colour, fluorescent red. 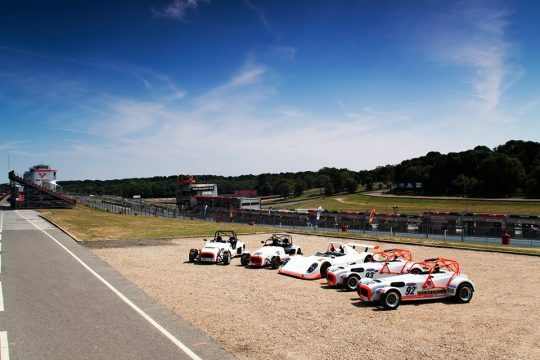 So we piled down to Brands, the team, friends, family and obviously the photographer, Ben Bonello. The aim of the day was to get everything from the cars that we needed for the website, all the pictures and the videos of the cars in action, which you can see here. So most of the pictures you will be seeing on the website and on promotional material such as our leaflets and banners, are photos from that day. So what have we been up to since July I hear you ask. Well, it has been a hard slog for our website designer, photographer and general all rounder Ben, getting everything together and actually creating this website. Michelle has chasing up loose ends and pushing Colin and Rob well out of their comfort zones. And Colin and Rob have been carrying on with the business as usual, with current customers as well as doing what they do best. Racing. So that is the story so far. This website is being finished, while we have the old one up, and signing people up for our launch discount and our mailing list, which you can join here. We have our social media pages up and working now which are constantly being updated; Facebook, Twitter and Instagram. All the trophies we keep winning just makes our Instagram look better and better!